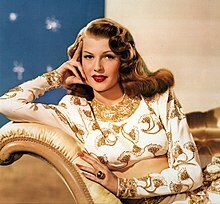 Rita Hayworth (born Margarita Carmen Cansino; October 17, 1918 – Mey 14, 1987) wis an American actress an dancer. She achieved fame in the 1940s as ane o the era's tap starns, appearin in a tot o 61 films ower 37 years. The press made the term "The Love Goddess" tae descrive Hayworth efter she haed acome the maist glamorous screen idol o the 1940s. She wis the tap pin-up girl for GIs in World War II. ↑ "Rita Hayworth, 68, films' 'Love Goddess'". Chicago Tribune. Associated Press. May 16, 1987. p. 8. This page wis last eeditit on 27 Februar 2018, at 02:49.